Maintaining our boats can be a messy business and we need to take care in choosing less toxic alternatives, and containing the pollutants that can escape into the air, ground and water. You can find lots of great tips on boat maintenance below, as well as in our Guide to Green Boating. Substances that are toxic to marine life are present in many products used to clean boats. Even “biodegradable” products often contain harmful ingredients. Chlorine bleach is dangerous to marine life and can be a health risk for people. Read labels and look for non-toxic, chlorine-fee, phosphate-free products. “EcoLogo” certified products can be less harmful. Minimize use of soaps and detergents. Keep your boat waxed and wash with fresh water and a brush. Use water carefully, as the Gulf Islands and other areas often have water shortages in the summer. Toxic Smart Solutions – many non-toxic cleaners for your boat can be made from ingredients you might already have on hand in the galley. Don’t let anything fall in the water, including sanding dust, solvents, strippers, etc. Choose water soluble solvents. Ensure that sanders, grinders, and other tools have dust collection fittings in place. Always have absorbent pads or rags on hand to contain spills. 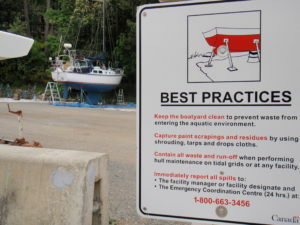 Use tarps on the dock and between the dock and the boat to catch spills and other materials. Mix paints and other liquids on shore and have only small amounts open on the dock or boat at any time. One of the greatest potential sources of pollution is the dry land area in marinas where boats are hauled out for cleaning. 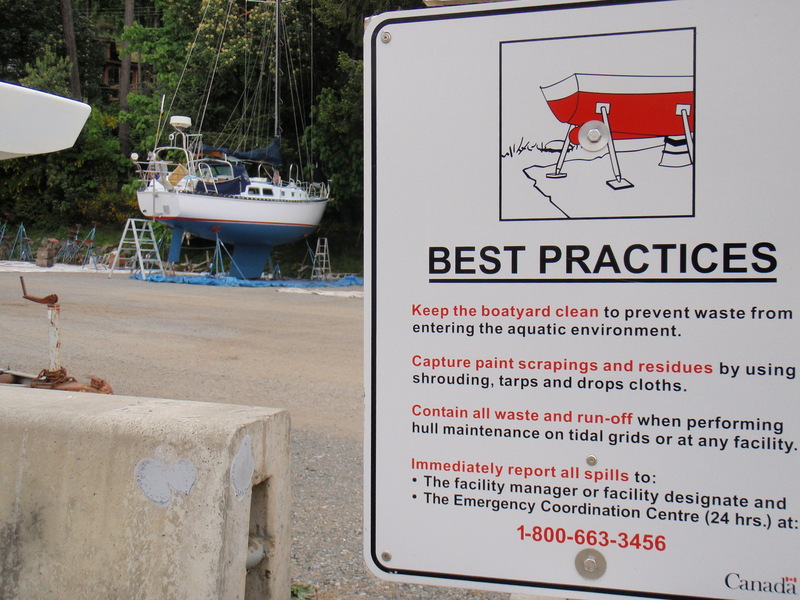 Paint residue is toxic and unless the marina or boatyard has installed a reticulating system, we need to eliminate this problem. Choose hard antifouling or “non-fouling” paints. Only use a soft brush or cloth to clean your hull in the water to help prevent the release of toxic paint into the environment. Don’t buy more product than you need. Reseal and keep for future use. Avoid tide grids for sanding, scraping or painting. Collect residue from cleaning, sanding, or painting with drop sheets. Become familiar with where to dispose of paints, solvents, and other wastes. Never pour paint or other liquid wastes down storm drains or any other drains.